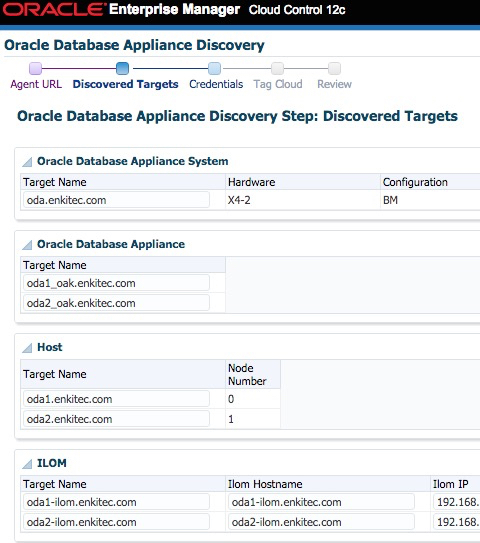 A few months ago, I heard that Oracle was releasing a plug-in for the Oracle Database Appliance (ODA (Oh Dah). At first I couldn’t find anything on this plug-in, then I was able to find it in the Self-Update for Plug-ins (Extensibility -> Self Update -> Plug-ins). After finding the plug-in, it needed to be deployed to the Oracle Management Server (OMS). Once deployed, it can be used to monitor the ODA; however, this plug-in is different from plug-ins like the Exadata, where you have a wizard to configure monitoring of the hardware associated with the engineered system. In order to use this plug-in, the two servers in the ODA have to have the EM agents installed on them. Here is a list of articles, by some great guys plus myself, that relate to installing agents in EM12C (if you don’t know how to do that already). Once the plug-in is deployed to the new targets for the ODA servers; then the ODA can be added to OEM. To add the ODA with the plug-in, it can now be done through the Add Targets Manually process. This step is a wizard that walks through adding the ODA; is done through the Add Targets Using Guided Process. 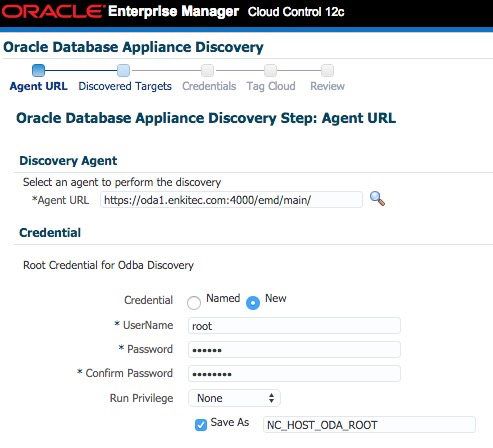 When starting the discovery, OEM will provide you a Discover Now button which initiates the wizard for discovering the ODA componenets such as ILOM and the servers. When the wizard starts, it asks for an agent URL. This is the agent installed on the first node of the ODA. Then provide the host root login that is stored in Named Credentials or a new login. The next step of the wizard, will provide a list of all the discovered targets in the ODA. On the credential screen, the wizard asks for the root password for both the host and the ILOM. If the passwords are the same across the ODA there is a n option to use the password for both items being granted. The Tag Cloud step is interesting. You really don’t have to put anything here; however, you can tag the ODA to help identify what is being added. There is a Create Tag button at the bottom if you want to create a tag. (I didn’t create one so I didn’t include a picture in this post). Finally, the review step shows what is going to be added to OEM as the ODA. Once the targets have been promoted successfully, you will see a green flag in the Discovery Stataus block. At this point the ODA has been added to OEM. 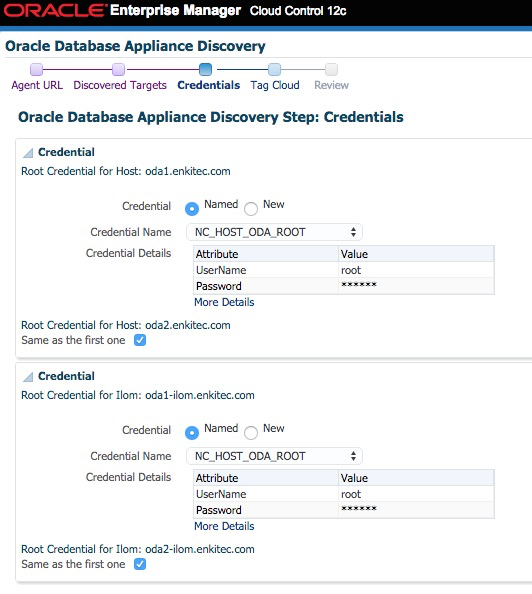 Now that the ODA has been added to OEM, it can be viewed from Targets -> All Targets -> Target Type -> Engineered Systems -> Oracle Database Appliance System. From here, OEM takes you to the home page for the ODA. From the ODA home page, it provides an overview of all the item going on with the ODA. Click around and have some fun reviewing what is happening with the ODA being monitored.